The global animal vaccine market is estimated to have surpassed 10 billion US dollars in 2015, and is looking up to break 20 billion US dollars by 2025. Clinical, sub-clinical and emergency disease challenges are a sustained constant global threat to livestock, poultry and aquaculture production. Producers and farmers need to be able to implement a fully integrated continuous disease prevention and control biosecurity programme to help prevent the introduction of pathogens onto and around their production site / farm. In order to achieve the best disease control management results they need a proven set of biosecurity tools that will help to address every aspect and disease transmission vector on their facility / farm. Each LANXESS Virkon™ disinfectant solution has been scientifically formulated to address specific biosecurity tasks, ensuring robust and powerful efficacy, and application flexibility that global producers and farmers can trust. 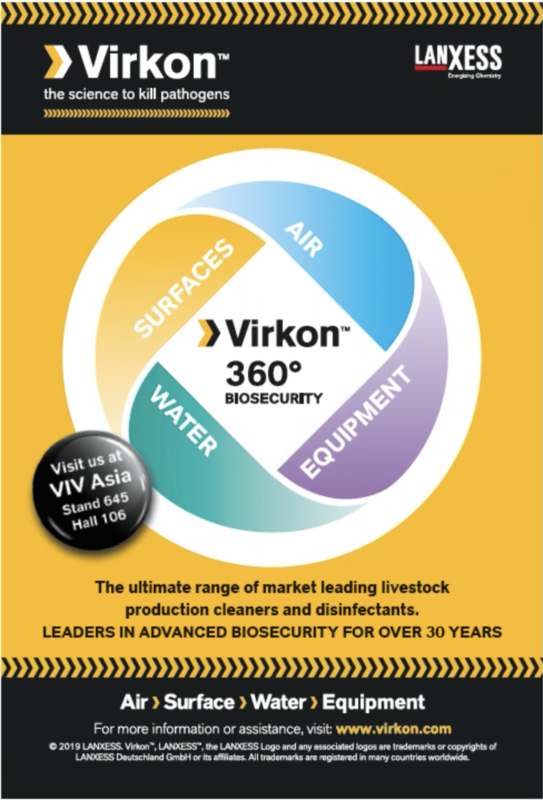 The LANXESS Virkon™ 360º approach to biosecurity best practice addresses every aspect of modern livestock, poultry and aquaculture production routine biosecurity and emergency outbreak situations: Surfaces, Equipment, Air, Drinking Water, Transport. During the last decade, herbs and phytogenic compounds have attracted a lot of attention for their potential role as alternatives to antibiotic growth promoters (AGPs) in monogastric animals. Optimising hatchery performance requires good data management. Data can be stored in various ways, ranging from simple Excel sheets to sophisticated data management software. Don’t miss this important panel discussion at VIV Asia – Antibiotic elimination in Southeast Asia: Feed additive alternatives & replacement strategies. With our hyper prolific sows producing increased numbers of born alive and greater numbers of light piglets, the role of colostrum in maximising lifetime performance has never been more important.